Bulgaria had EU's second lowest debt-to-GDP ratio among the EU 27 in 2011 – 16.3%, according to data released by Eurostat. The lowest ratio of government debt to GDP was recorded in Estonia (6.0%). Bulgaria is followed by uxembourg (18.2%), Romania (33.3%), Sweden (38.4%), Lithuania (38.5%), the Czech Republic (41.2%), Latvia (42.6%), Slovakia (43.3%) and Denmark (46.5%). Fourteen Member States had government debt ratios higher than 60% of GDP in 2011: Greece (165.3%), Italy (120.1%), Ireland (108.2%), Portugal (107.8%), Belgium (98.0%), France (85.8%), the United Kingdom (85.7%), Germany (81.2%), Hungary (80.6%), Austria (72.2%), Malta (72.0%), Cyprus (71.6%), Spain (68.5%) and the Netherlands (65.2%). In 2011 the largest government deficits in percentage of GDP were recorded in Ireland (-13.1%), Greece (-9.1%), Spain (-8.5%), the United Kingdom (-8.3%), Slovenia (-6.4%), Cyprus (-6.3%), Lithuania (-5.5%), France and Romania (both -5.2%) and Poland (-5.1%). The lowest deficits were recorded in Finland (-0.5%), Luxembourg (-0.6%) and Germany (-1.0%). Hungary (+4.3%), Estonia (+1.0%) and Sweden (+0.3%) registered a government surplus in 2011. 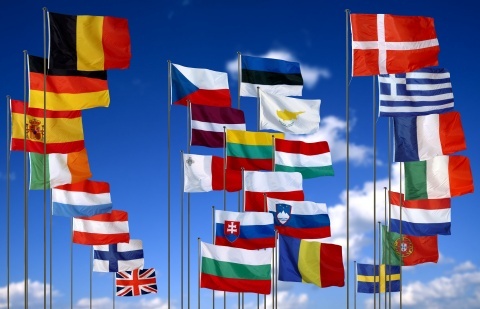 The European Union's statistics institute Monday confirmed the 2011 budget-deficit estimates of most European countries, with the exception of Ireland, which Eurostat forecasts as being much higher. Eurostat sees Ireland's budget deficit at 13.1% of gross domestic product, compared with Dublin's projection of 9.8%. Eurostat estimated that overall the government deficits in the 27 EU countries and also in the 17 euro-zone countries shrank compared with 2010, but debt-to-GDP levels increased.